The eminent Protestant theologian Karl Barth once wrote: “What occurs in Mozart is rather a glorious upsetting of the balance, a turning in which the light rises and the shadows fall, though without disappearing, in which joy overtakes sorrow without extinguishing it, in which the Yea rings louder than the ever-present Nay.” According to Barth, in Mozart there is a ringing endorsement of the triumph of the fiat over the non-serviam within the human drama. How might the “whole tragedy of human existence” express itself in the oeuvre of one composer? The Swiss theologian Hans Urs von Balthasar, also a devotee of the composer of Salzburg, had this to say, referring to the The Magic Flute: “Is there a better, indeed another manner to bear witness to the nobility of our divine filiation than to make present whence we came and where we are going?” The whole human journey, both our loss and our finding our path again, is contained in his music. Balthasar goes on to say: “Mozart serves by making audible the triumphal hymn of a prelapsarian and resurrected creation, in which suffering and guilt are not presented as faint memory, as past, but as conquered, absolved, fixed present.” Here is the reason for the joyfulness, then: the tragedy is present only through the lens of the ultimate resurrection. Balthasar’s appreciation was probably influenced by Adrienne von Speyr’s more mystical apperception of the heart and soul of Mozart. In the collection of her spiritual insights into various figures of history, mostly saints and artists, she had this to say about the evangelical heart of Mozart: “And he loves people because they are the dear Lord’s creations, and he is happy to be able to delight them through his music. And in his own way he would like to put the question of God before them, even in his merriest pieces.” According to von Speyr, love of neighbour inspires both the depth and lightness of his music, as well as his personal faith. In 1781, he also wrote about his faith in a letter regarding his desire to marry Constanze, saying “the voice of nature speaks as loud in me as in others, louder, perhaps, than in many a big strong lout of a fellow. I simply cannot live as most young men do these days. In the first place, I have too much religion; in the second place, I have too great a love of my neighbour and too high a feeling of honour to seduce an innocent girl…” He later wrote the Mass in C Minor in thanksgiving for their marriage. "It is the humility which speaks out of Mozart’s music in such a human way, lending it that metaphorical quality which may seem facile to the superficial listener, but for one attentive to the essential, that makes for what can stir most keenly—namely the lightest vessel with the deepest content. Only he who rests in God can overcome both sadness and happiness with such inner bliss that these opposites of the human soul can work upon us in a similar way. Mozart’s music is carried by an inner joy that brings all emotions into harmony, be they joyful or painful. Humour and deep seriousness seem to accompany one another in his art and in this life all the way to heaven’s gates. It is humility before things as they are which makes Mozart’s world so sublimely natural." There are many things in Mozart’s music, but pompous grandiosity is not one of them. Paradoxically, it may be his humility that lends him his greatness. 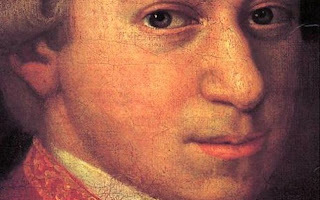 Mozart’s full baptismal name was Johannes Chrysostomus Wolfgangus Theophilus Mozart. He was named after the great patristic writer St. John Chrysostom, nick-named “the golden-tongued” on account of his great eloquence when writing of God. It was an appropriate name for a composer whose musical eloquence would know few parallels. Mozart composed tributes to the marriage of opposites: of the natural and the sublime, of child-like simplicity and boundless depth, of a suffering that defeats death, and of an infinite God that becomes an infant in our world. It is therefore fitting that Mozart’s anniversary falls at the beginning of the Advent. Perhaps we might find time to listen to that Mass in C Minor, or even Pope Benedict's alleged favourites, the Clarinet Quintet and the Clarinet Concerto. Somewhere in them all, you can hear traces of the mystery of mysteries, of the Word become flesh. Venite adoremus. That was really well-written and very informative. I didn't know there were so many religious links behind Mozart and his music! I feel enlightened. Thank you for this theological tribute to Mozart! I have probably listened to Mozart more than any other composer in my life, and he is certainly the first composer I can remember listening to (the Flute & Harp Concerto, the Clarinet Concerto, and operatic arias in particular). It's true: when I listen to Mozart, there is no question in my mind that Joy triumphs. Thanks for this post John. I think that Amadeus is a great film, but one thing I don't like about it is that it vividly presents a memorable character for Mozart (and Salieri) that probably isn't accurate in all respects! It's hard for me not to imagine Mozart looking like Tom Hulce in a pink wig. So reading an article like this is a good corrective! Thanks Adam. I agree that while Mozart wasn't a conventional saint (if such a thing is possible), but the movie leaves you with an image of a buffoon. We're probably due for another interpretation!